What is the classic piece of clothing which we think about when we think of a bowler? Shoes, right? Does that count as clothing or is that more of an accessory? You know what, it does not matter. The point is that shoes are an important part of a bowler’s kit. If you have the right pair of shoes, you are going to get the best balance between grip and slide, which will translate to a better release of the ball and, in turn, higher scores. If you decide to go with a regular pair of bowling alley shoes over a professional pair, you are going to knock points off your score. A great bowling ball will create more opportunity for points, and a great pair of shoes will aid you in that. We have taken a look at some of the best shoes out there and chosen some of our favorites. All of the shoes on this list are going to give you an advantage when you are on the lanes. These are great shoes for any bowler. They will improve the scores of amateurs and profession-als alike. Great balance, comfort, and breathability. They are an affordable option which will give great support and grip to the majority of bowlers out there. A good all-round shoe. We like how comfortable these shoes are. They are great for beginners, and you will not have to shell out a lot of money to get them. PS: If you're looking for bowling shoes for men you can find them here. These are great shoes for any bowler. They will improve the scores of amateurs and professionals alike. Great balance, comfort, and breathability. These are the best bowling shoes which we could find. They may be a little more expensive than some other shoes on the market, but they are worth it. Let’s start with the soles and work our way up. The soles on the bottom can be switched and changed to match your bowling style. Most shoes try to be a one-size-fits-all (when it comes to performance, not when it comes to the fit) but these shoes allow you to customize your shoes to provide the best fit and performance possible. They also fit extremely comfortably. The shoes are sleek and elegant, they look stylish, and they offer a lot of comfort and cushioning. The soft leather is breathable, comfortable, and flexible, giving your foot room to move. We like the toe drag protector on the front of the shoe which prevents the sole from peeling through constant use. These shoes give you excellent grip and some slide. When you come to throw the ball, you will find the combination of the two will bring you balance and improved accuracy. These shoes look exactly like a pair of sneakers and fit with just as much comfort. The tongue and collar are cushioned for added comfort, especially when the laces are pulled tight for a snug fit. The laces are also adjustable so you can find that perfect fit. You will also see that the footbed is cushioned to support high arches or flat feet. The uppers feature mesh panels which will allow the air to circulate, keeping your feet fresh and removing any moisture in there. This will help you to avoid blisters and abrasions. We like how these shoes look. They have a modern yet retro look. They will match any outfit while still giving you superior performance. We like the loo​k of these shoes. If you want something different, then go for these shoes. They also allow for more slide, so, if that is what you are looking for, then you have found it. If you like unique looking shoes, then you should buy a pair of these. These shoes are unlike any other pair we have seen. We love the multicolored look which will bring some style and panache to the bowling alley. These shoes look so good that you may want a second pair to wear when you are not bowling. Often a focus on design means you lose something in the performance. This is not so with these shoes. They are comfortable and easy to use, though you may need to get used to the slide. They feature more slide than the average bowling shoe but a few games with them, and you will not even notice. These are great for amateur or intermediate bowlers. They do not have as much punch as some more professional shoes, but they will get the job done and at an affordable price. The padded insole, collar, and tongue also mean that you have a comfortable fit. The shoes will fit a little stiffly when you first put them on, but a few games of bowling will soon soften then out and have them conform to your feet. We like the stylish look of these shoes which take you away from the sneaker or classic bowling shoe look. They are bowling shoes which do not look like bowling shoes. 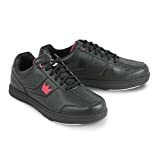 This is an excellent pair of starter shoes for a beginner bowler. They give you a great balance between grip and slide. The microfiber insoles will help to deal with any moisture (and, let’s face it, smell) which may accumulate in the shoe, inhibiting the growth of bacteria. The mesh lining will also help the air to circulate, helping the moisture to be wicked away and the interior of the shoe to be cooled. We like the look of these shoes. The matte black is complemented by the bright turquoise to bring professionalisms and fun together — a well-made pair of shoes. A great pair of shoes for beginners or for professionals to pack in their kit bag as a spare pair. For the price, you will be hard pressed to find a better performing pair. We like the look of these shoes. They have a retro feel of the classic bowling alley shoes while being brought into the present day. 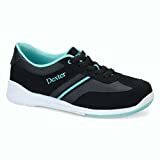 The durable material is going to hold up well under pressure, and the stitching ensures that the shoes are not going to fall apart through repeated use. One thing which we like about these shoes is the amount of room you get in the toe. You get space so that your toes are not cramped, but that does not cause your foot to slide or slip. These shoes are affordable with a performance that's better than what you pay — a shoe which will give you great balance and improved scores. You do not have to wear these shoes too many times before they pay for themselves when it comes to comparing them against rentals. The microfiber slide pad on both feet is a nice touch for those who like more slide. When we put these shoes on, we loved how the padded collar and tongue felt. The EVA midsole also added to that comfort. If you are looking for a shoe with more slide, then look no further. When it comes to bowling, we all have memories of the two-toned shoes which we would rent from the bowling alley for a couple of bucks. We would try them on, ignoring the fact that hundreds of other pairs of feet had been in them, and marvel at how much grip they gave us on the lanes. They improved our performance, right? Or, at least, we believed that they did. We may as well have thrown those shoes in the garbage for all the good they actually did. Thankfully modern technology has improved bowling shoes to a level where they can make a significant difference to our bowling performance and scores. Modern bowling shoes not only improve how we bowl but they look good (and make us look good) while they are doing so. Modern shoes are comfortable, stylish, and give us the grip and slide needed on the lanes. We have found some of the best pairs on the market. Take the first step into the world of profes-sional bowling with your own pair of bowling shoes. Let’s take a look at our favorite couple. In a hurry? Here's our top pick for the pro, the all-rounder and the best value for money shoes. We like the performance you get with these shoes. If you have the money to spend, then we would recommend these shoes to any bowler. If you are a professional bowler, then these are a must-have item. These are an affordable option for any level of bowler. They look and feel great, and will elevate your game through added comfort and focus. For the price, you are not going to find a better shoe. They are stylish, comfortable, and will help you to elevate your game. 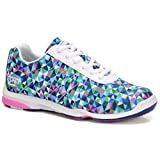 PS: If you're looking for bowling shoes for women you can find them here. These are simply the best pair of shoes which we could find to bowl in. Let’s start with putting them on (the feel, not actually how to put them on; we are sure you know how to put on a pair of shoes). From the moment you have the shoes on your feet, you will feel comfortable. There is enough room around the widest part of your foot so that you do not feel cramped. There is great arch support, and your foot will feel cushioned. The shoes also look good, much better than the traditional bowling alley shoes. These are shoes that you would be happy to wear with any outfit (though we recommend that you save them for the lanes). When it comes to performance, these shoes will ensure that you do not slip when you are bowling your ball. You will also feel enhanced balance when you are throwing the ball. This translates to better shots. If you can release the ball from a balanced stance, you have more chance of the ball going where you want it to. We like the leather toe drag. Over time, bowling shoe soles can begin to peel at the front with the added friction of bowling. The leather toe drag will ensure that the sole stays in place, elongating the life of your shoe. These shoes are great for anyone who has sweaty feet (we are looking at all bowlers here). The cotton upper and stylish design has created one of the most breathable shoes on the market. The circulation of air will reduce the amount of sweat in your shoes (along with the smells) while keeping your feet fresh. The added comfort that this brings can only give you more focus on your game. These shoes are breathable, and they are comfortable too. They look just like a regular pair of shoes, and they fit as comfortably as any ordinary pair of shoes. They provide excellent grip for when you are bowling, allowing you to release the ball from a balanced position. If you have wide feet, then look no further than these shoes. If you do not have wide feet, then these shoes will be comfortable and elevate your game. We like the balance between slickness and stickiness. If you have wide feet, then you have found the perfect pair of bowling shoes. Have you been left feeling uncomfortable and restricted by bowling alley shoes or other bowling shoes? Having wide feet means that you have to choose your shoes carefully. Wearing the wrong pair of shoes can significantly affect your bowling score. These shoes will accommodate and cradle wide feet bringing you the comfort you need to concentrate on your game. The other thing which you get with these shoes is the right balance between friction and slide. The shoes are not too sticky nor are they too slick. When you release the ball into the lane, you will find that the balance between the two will result in a balanced shot and more pins knocked down. These are great shoes for all level of bowlers. For the price, you are not going to find a better shoe. They are stylish, comfortable, and will help you to elevate your game. These shoes look great. We like the understated design, the solid color with slight colorful embellishments. They do not look like bowling shoes, and we mean that as a compliment. With a choice fo two monochromatic colors, you are sure to find a pair which matches your outfit or color scheme. The best thing about these shoes? They are extremely affordable. For a shoe so affordable, you are going to be hard pressed to beat these ones for comfort. As soon as you slip them onto your feet, you are going to feel as if your feet are home. This is important for keeping your focus on the game and not on your feet. We also like the slickness of the shoes. You get a little bit of movement when you are throwing the ball but not enough to throw off your game. These are the perfect shoes for adding more power to your ball. We would recommend these shoes to any level of bowler. This is a pair of shoes designed solely for right-handed bowlers so you should be aware of that before you purchase them. If you are right-handed, then read on. When we think about bowling, we think about two things, power, and accuracy. If you want power, then you need a lot of traction to be able to deliver that power. That is what these shoes are capable of. From the moment you put these shoes on, you will feel more powerful. As you take your steps with them, ball in hand, you will feel the grip and cushioning pushing you forward. As you release the ball, you will release it with more power. 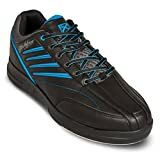 If you are an aggressive bowler who bowls with a lot of speed, or if you want to increase the power of your bowl, then these are a great pair of shoes. They help you to generate the needed power to smash through the pins but do so while bringing comfort to your feet. We love the look of these shoes. If you want to make a fashion statement, then these are the shoes to buy. That is not to say that they do not perform. All levels of bowlers will find something from these shoes. There is no doubt about it; these shoes are the most stylish pair of bowling shoes which we have found. The colors are great, the design is impeccable, and the overall look is elegant and enticing. It does not matter what you wear these shoes with; they are going to look great on the lanes. They will look so good that you may want to invest in a couple of pairs, one for the lanes and one for your everyday life. A lot of the time we find that style does not always translate into functionality and comfort. These shoes have a little bit of everything. They are stylish, fit well, and will give you good performance on the lanes. These shoes are cushioned, light, and extremely breathable. When you have them on your feet, you will feel like you are walking on air. If you have had problems with clunky shoes, then you should give these a go. These shoes have been designed with comfort in mind. They are 40% lighter than most conventional bowling shoes on the market, making it easier to get up speed when moving towards the lane. The EVA outsole is one of the reasons for the lightness of the shoe and also adds to the comfort, molding around your foot when you have the shoe on. The outside is grippy, flexible, and cushioned, offering you a balanced shot and a cushioned foot. The mesh upper allows your foot to breath, no matter how long you are bowling for. The heel pads are cushioned and non-marking, saving the lane from any damage. We like the unique design of this bowling shoe. It is not for everyone, but those who love the shoe will really like it. The shoe is sturdy and strong and can be used by any bowler. These shoes come with one of the most unique (and stylish) designs which we have seen on a bowling shoe. 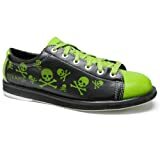 The black and green design, with skulls, will not appeal to every bowler but will be loved by many. One thing which we really like with this bowling shoe is how strong and durable it is. The design is fun and whimsical, but a lot of focus has been put into making this shoe as robust as possible. From the reinforced stitching to the metal eyelets, this shoe is going to stand the test of time. 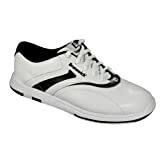 This is a shoe which is comfortable and will be useful to right and left-handed bowlers. It offers a lot of support and will help to improve your bowling performance. If you are serious about bowling, then your dedication only has one place to start: The Ball. The best shoes will give you an advantage, the best bag will protect your ball, a lot of practice will make you a better player, but there is no better place to start than with a professional bowling ball. A great bowling ball will give you an advantage when you are playing. Forget about the balls that your bowling alley provides for you. Get your own ball, customize it if you want to, and never look back. Bowling ball technology has advanced so much that the right ball for you can take all of your practice, dedication, and passion, and turn it into higher scores, more accurate shots, and a lot more power. There are so many balls out there that it can be hard to know where to start. Do not worry; we have you covered. 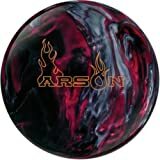 We have searched for the best possible bowling balls (and the widest variety) so that you can easily select the best one. ... and if you're in a hurry you'll find our top-3 picks below. This is definitely a ball for professionals. You get a lot of power with this ball and a lot of hook. It takes a little practice to master the unique hook on the backend, but when you do, you will find that your score is elevated a lot. This is an excellent ball for those who bowl aggressively or those who want to. The ball has a lot of movement on the back and will travel through the pins with a lot of speed and power. This is our favorite ball on the list, and we are sure that it will give you better scores. Professionals are not going to get a lot from this ball, other than using it as a backup, but beginners will notice an increase in their points when they move up to this ball. Great for accuracy and power training. Hybrid coverstocks take advantage of both solid and pearl reactive coverstocks. Solid coverstocks seek to react better on medium and heavy-oil lane conditions. Pearl reactive coverstocks cause the ball to respond better on dry lanes and extend the length of the bowl. With hybrid coverstocks, you get the best of both worlds. This ball will give you great initial power and then break at the right moment giving you an awesome finish through the pins. 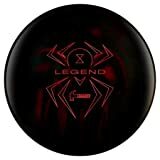 Black Widow bowling balls have always had a reputation for crafting great bowling balls, and the Legend elevates that passion for craftsmanship and bowling. This is an aggressive bowling ball for those who bowl aggressively and those who do not. 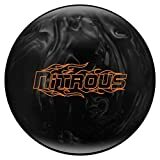 When you add this bowling ball to your collection (or use it as your main bowling ball), you will see your scores improve almost immediately (though do not hold us to that). 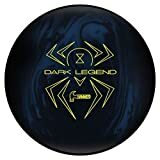 The ball works well and, with the unique neon spider design and, it looks great too. Wait for the moment your friends gasp as you bring it out of your bag (do not hold us to that either). This is an excellent ball for anyone who has hit their limit with their previous ball. If you find that you have plateaued with the ball you are using, then this one will help you to punch through and hit the scores that you know you deserve. We love the design of the Hammer balls. The dark swirl of the ball is complemented by the bright neon of the lettering and image design. These balls look great in and out of your bowling bag as well as when they are rolling down the lane. This ball has a solid cover stock and a gas mask core weight block internally. This gives you a lot more control of the ball at high and low speeds. The break at the end of the lane is predictable, allowing you to dictate where the ball finishes. The consistency in the break of the ball translates into consistency for your throws. This is another ball that, with a little practice, will improve your scores almost out of the box (or bag). If you are a professional, then this is a tremendous backup bowling ball. The ball does not have a lot of spin and will travel down the lane in a straight line. It is a great ball for beginners too. If you are starting out, then this ball will stay in the middle of the lane when you throw it straight. It is an excellent ball for improving your power and accuracy before you begin to add a lot of spin to your ball. If you want to get up to high speeds, then this is the ball to do it with. We like that you have options with this ball. There is a multitude of colors, sizes, and weights. You can match the ball to your own personal style, and elevate your game. If you are a beginner, then upgrading to this ball will add points to your score. Your accuracy and speed are going to improve with this ball. A great beginner ball or transitional ball. This is definitely a beginner ball. If you are used to using a ball which does not curve, then this is the next ball for you. It introduces you to hook in a non-obtrusive an intelligent way. 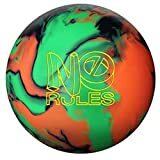 A great ball to transition to your next level of bowling. 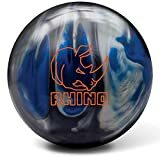 The image of a rhino in a bowling ball invokes pins being smashed and knocked over with ease and this ball will do that, but not in the way that you would think. The ball does offer you good power but not as much as some other balls. Where this ball shines is in the hook. You will get a great break at the end of the lane with this ball, coming into the pins from an angle and knocking down more pins that you would with your previous ball. That is if you are upgrading to this ball. This is not an expert ball by any means, but a great ball for transitioning from a purely straight ball. We like the design of this ball, and you will notice your control and spin improved when using it. This is a great transitional ball for moving up to the next level. You will see an improved score but, more importantly, you will see improved performance and accuracy. We would recommend this ball for an intermediate bowler who wants to improve the hook in their game. Beginners will find a lot of value from this ball too. 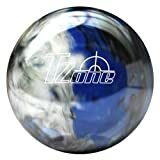 This is an excellent ball for any level of bowler or skill of bowler. Professionals are not going to see their scores increased by this ball over other professional balls, but it is a ball which will improve the score of intermediate or beginner bowlers. The main selling feature of this ball is the amount of spin which you can get from it. Over just a short period, you will notice your game improve and your scores boosted. We like that the hook of the ball can be adapted by changing your hand position and that you can find predictability in that hook to hit the pins more accurately over time. Once you have mastered the spin of the ball, you can begin to add more and more power to improve your overall score once again. This ball looks like there really is a storm about to hit the lane, and that is precisely what happens when you bowl it. When you bowl it on a medium-oil lane, you will notice that it is very aggressive, plowing through the pins with a lot of speed and power. Even on high-oil lanes, you will get lots of heavy hits on the pins. We like the amount of hook which you can get with this ball. Through the first part of the lane, the ball will glide down the wooden surface. 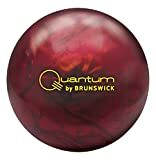 The ball has a unique breakpoint which, once mastered will give you a lot of power and consistency through the pins. This is a high-performance ball for those who know what they are doing. An excellent ball for intermediate bowlers. If you want to throw your balls with a lot of power, then this ball will let you add some hook to your bowls without having to adjust that power. This is a great ball to elevate your game. If you bowl with a lot of speed, then this ball will give you the control which you crave at that speed. 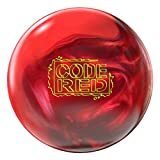 If you have low RPM on your bowl, then this ball will help you to either plow through the pins without adding to your RPM or help you to add some more rotation to your fast bowls to add hook at the back end and plow through the pins with hook and power. The added power and hook of this ball helps you to avoid getting as many splits as you would with less expensive balls. It is definitely a ball which is beneficial to those who bowl their balls at speed. We like that this is an excellent ball for all skill levels. Beginners will find consistency with the ball, and experts will enjoy the follow through at the end as the ball hits the pins with more power and accuracy than they are used to. The one thing which you get with this ball is an exceptionally smooth drive through the start of the lane. The ball has a smooth roll when you let it go and watch it career down the lane. This adds predictability to your roll that beginners and experts will appreciate. It works a little better on dry lanes that it will on oiled, but you will still get consistency from both. You get great RPM with this ball, adding some hook and power on the back end. You will be amazed at how great the contact is when the ball does get to the pins. This ball is great for any level of bowler, but we would recommend it most for intermediate bowlers or those who want to add to or improve their hook. A great ball for oiled lanes. This ball looks great and bowls great. If you are a beginner or intermediate bowler, then this ball will help you to elevate your score. It does this by adding some hook to your game. You need to practice this hook to master it, but when you do, you will notice your score increase. The slight hook in the ball will help you to find consistency when hitting the pins; then you can add more hook to the ball to further improve the number of pins you are knocking down on average. This is a great ball for expert bowlers. You can add to your speed and power while having a lot of control over the spin of the ball. If you like to bowl aggressively, then this is the ball for you. This is a great ball for heavy-oil conditions. The Abralon, high-grit finish will give you a lot of grip on the lane which will translate to a lot of hook as the ball grips. The carbon fibers which are infused into this ball help to give the ball a strong core which is powerful and lightweight. Take all of this together, and you have a ball which will travel with a lot of speed, have a lot of power, and will hook lots on the backend. 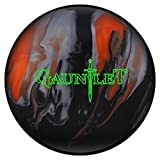 The Hammer Gauntlet ball gives you an aggressive bowl which will provide you with more knocked-down pins and a higher score. Bowling is one of the great North American pastimes. Is there a better feeling than that first strike? Followed by the next one, and the next one? Or, if you are like us, that single strike around frame three of four to give you extra confidence and help you convince yourself that you are ready for the pros? No matter what your skill level, every passionate bowler needs a good bowling ball and, if you have a good bowling ball, you are going to want a place to store and transport it safely. A great bowling bag will do just that. ... and if you're in a hurry our top-3 picks is listed in the table below. 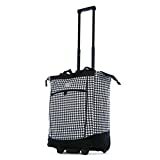 Olympia Fashion Rolling Shopper Tote - Houndstooth, 2300 cu. in. We like the functionality mixed with the style. This is a bag which is easy to roll, will hold up over time, and looks great doing so. This is a bag which makes a fashion statement while still being a functional bowling bag. 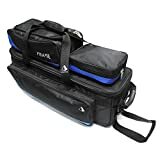 This is a great bag to buy for younger bowlers. Those who do not have a lot to haul around do not need a bag with lots of compartments and storage space. This bag stores your ball safely and does not take a toll on your bank balance. If you are looking for the perfect bowling ball bag then look no further, this one has it all. There is enough room for two of your balls, along with your bowling shoes, and other bowling accessories. The reinforced zippers are not only smooth, but they also add stability to the bag to ensure that your heavy bowling balls do not strain the weak points of the bag. The wheel bearings mean that you get a smooth roll, even when the bag is at or exceeding capacity. The telescopic handle also provides you with multiple carrying options. The handle and large wheels also make it an excellent bag for rolling up steps when you cannot lift it — a great bag for any bowler. ​Who says that a bowling bag cannot be fashionable? This rolling tote from Olympia comes in a variety of colors. You can match your team colors, your personal colors, or your bowling ball colors. The heavy-duty fabric and polyester will cradle and bear the weight of your bowling balls, holding up over time. You really do get what you pay for, and with this bag, you do not need to worry about fixes or replacements over time. The in-line skate wheels make this rolling tote easy to maneuver and pull behind you. The re-tractable handle will help you to carry even the heaviest bowling balls, and the handle on the top offers another way for you to carry the bag. The bag is top loading, and there are front and side mesh pockets for storing your shoes, gloves, and other bowling equipment. 20” x 14” x 8"
We like the variety of styles and colors which this bag comes in. There are enough color combi-nations to keep everyone happy while offering the functionality that you would expect with a much more expensive bag. 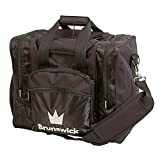 ​This is a great bag for hauling multiple bowling balls. The bag tips up, with an extendable handle, to roll behind you when you are traveling. When you get to your destination, lay the bag flat and open it. Both of your balls are stored safely side by side with easy access to both. The ball compartment is completely padded, so you do not have to worry about dropping or bumping the bag. You will also find a shoe compartment on the top of the bag, big enough for those with the big-gest feet. The shoe compartment is vented so that the smell of your feet does not permeate the bag (we are not claiming that you do have smelly feet, but best take no chances). The 600-denier polyes-ter Oxford material is sturdy and robust. Combine the outer shell with the padded interior, and you have a bag which will protect all of your belongings. The wide wheels give you a smooth ride, balance, and stability. The padded handle offers you comfort as you are pulling the bag behind you or loading the bag into your vehicle. The identifying tag ensures that you never lose your bag when you are traveling. This is a great bag for any-one who is looking for features. This is a great bag for anyone who has a lot of equipment. For the price, you will be hard pushed to find a bigger and more spacious bag. The ability to remove compartments is a nice touch, allowing you to switch the size of the bag at will. ​If you are looking for a large bag, then you have found it. This bowling bag from Pyramid path has enough room for three of your bowling balls, along with a pair of shoes and multiple accessories. The best thing about this bag is that the compartments are removable, allowing you to customize your bowling bag fully. If you have three balls to transport, and a lot of accessories, use the bag to its fullest capacity. If you are only taking two balls, and want to save some space, you can detach the shoe compartment and put your shoes in the main compartment. You can do the same with the accessory compartment. Both compartments detach and reattach with ease. The large compartments and pockets mean that you really can take everything with you. The fact that most compartments are external to the main compartment also means that you never need to go digging through one compartment to find your gloves sitting under everything. This is a great entry bag. If you only have one bowling ball and a handful of accessories, then this is the perfect bag. 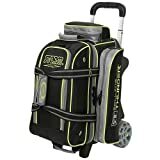 For someone who is just starting out with bowling and does not want to pay for an expensive bag, this one is perfect. ​Created from durable 600D polyester and jacquard weave fabric, this is a bowling bag which does not look or feel like a budget bowling bag. The construction alone will make the purchase worth its weight in, well, polyester. The outer shell is durable and sturdy, the inner lining is padded with thick foam to cradle your ball, and the bottom of the bag is reinforced with 3mm hard plastic. For the price which you will pay, you are not going to find a bag which will do a better job of protecting your ball. There is also enough room to carry your accessories. There is no dedicated shoe compartment, but there is enough room in the main compartment (and two side compartments) to store your shoes, along with your socks, towel, tape, gloves, and anything else which you might need. The small front compartment also offers a storage solution for those small items, such as keys and wallets, which you need to get to quickly. The padded shoulder strap gives you a comfortable way to transport your belongings. If that strap gets in the way, and you prefer to carry the bag by the other handles, then it is also removable. This bag is not going to do what other bags can, but it will get the job done for you. 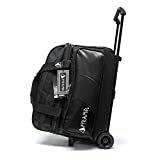 This is a great entry level bag for someone who is getting into bowling or a backup bag for someone who already owns a bowling bag. The bag is affordable without being cheap. When it comes to a bowling bag, you do not need bells and whistles to be able to carry your ball (in fact, we are not sure that bells and whistles have ever been used in bowling). This bag is simple, affordable, and gets the job done. The heavy-duty material is a step up from what we would consider a ‘budget bowling bag’. When we think about budget bags, we are looking at the price and also the quality. This bag may have the price tag of a budget bag, but the quality has been elevated. The tough exterior will protect from rips and tears. The inner padding (which is removable) will cushion and protect your bag as well as some more expensive options. There is enough room for your ball, shoes, and other accessories. The large main compartment, two side compartments, and the small front compartment mean that you can keep all of your bowling belongings organized and separate. This is as simple a bag as you can get. There is enough room for one bowling ball and not much else. If you are starting out, then this is perfect. The large zipper on the top slides open easily to accommodate the ball and some of your other small accessories. The padded shoulder strap fits easily and comfortably over your shoulder, making it simple and stylish to haul your ball around. The material is sturdy, protecting the bag from rips and tears. Basically, what you see is what you get with this bag. There are no extras here, and that translates to an extremely affordable bag for you.